Mon 29 Aug 2016 — The Space Monkey designed by SASD industrial design students and UB engineering students is set to soar at the end of August 2016. 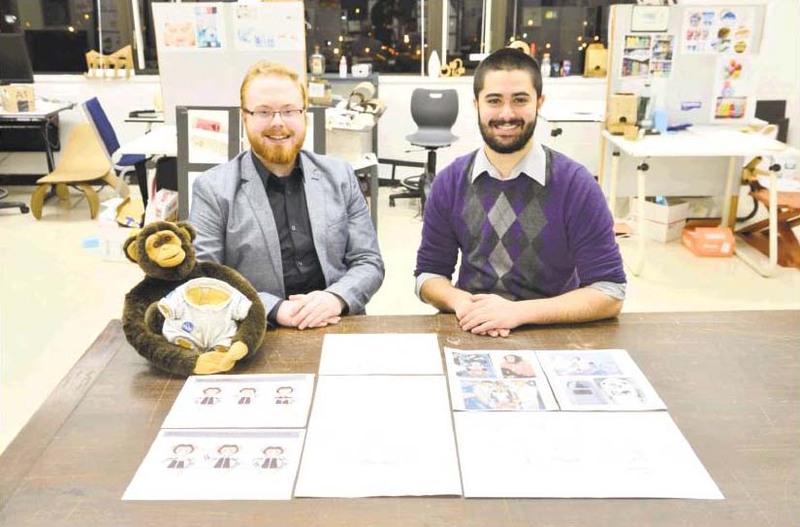 Two SASD industrial design students got scholarships to further develop their design for a remote robotic sensor set that will let young Earth-bound students engage with it from the edge of space. I’m thrilled to share that the University of Bridgeport High Altitude Servo-Motor Testbed payload was certified for Near Space flight at the end of August in New Mexico. Our integration team (Jani Pallis, Phil Carroll and Larry Reed) traveled to NASA’s Columbia Scientific Balloon Facility in Texas this past week for testing and integration into NASA’s HASP experimental platform. The testbed underwent vacuum, thermal, power and command and control testing over several days. Our testbed passed all tests on the first go around and is now headed to New Mexico where the 24 hour/ 24 mile high (125,000 feet) flight will be launched. Dr. Neal Lewis and Josh Hauge will be our flight team, but due to the lengthy dates teams are expected to be in New Mexico at the start of the semester (Aug. 24 – Sept. 5th), they most likely will be joined/relieved by Larry and Jani. While all team members contributed, special thanks go to Larry Reed, Xuan “Sam” Zheng and Maheshwari Kumar Rakkappan. CT Space Grant provided travel grants for Drs. Pallis and Lewis and students Phil Carroll and Josh Hauge for this project. The HASP flight certification is especially important because of the recent $200,000 NASA award that UB shares with the CT Space Grant Consortium team (Hartford, Vanderbilt, Wesleyan) for the Undergraduate Student Instrument Project (USIP). Our HASP payload is the prototype for the USIP payload, and we will be going through similar testing and integration at the same NASA facilities. This is also capacity building for CubeSat. There are 12 different university payloads onboard HASP – 8 small and 4 large experiments (UB has one of the large experiments). This will be one of the few times in the history of HASP that all 12 will fly later this month. I know I am not overstating that this would not have happened without Larry. Our senior statesman of all things electronics went out of his way to assist both the team from Illinois and Puerto Rico, who had non-functioning payloads when they arrived. The national HASP director acknowledged and thanked Larry for his help. 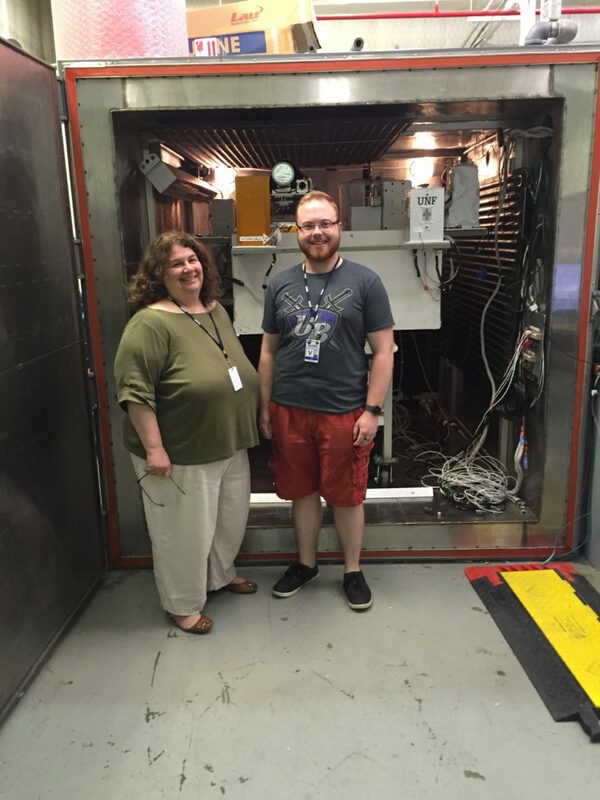 Attached are Jani and Phil in front of the thermal/vacuum test chamber. The other picture is HASP with some of the payloads attached before being forklifted into the chamber. UB’s payload is the rear right one (to the left of the fellow with the orange shirt.) You can see Colorado’s telescope in the front left. It has been a great experience and we have already obtained some good data from the tests.